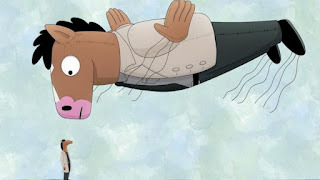 The Dads take a deep dive into the recently released Season 5 of Netflix's hilarious and depressing "Bojack Horseman," created by Raphael Bob-Waksberg and starring Will Arnett, Amy Sedaris, Paul F. Tompkins, Alison Brie, and Aaron Paul. Spoilers abound! Listen here or subscribe to the show via iTunes, Google Play, Stitcher, or some trendy indie podcatcher app that we haven't heard of yet.